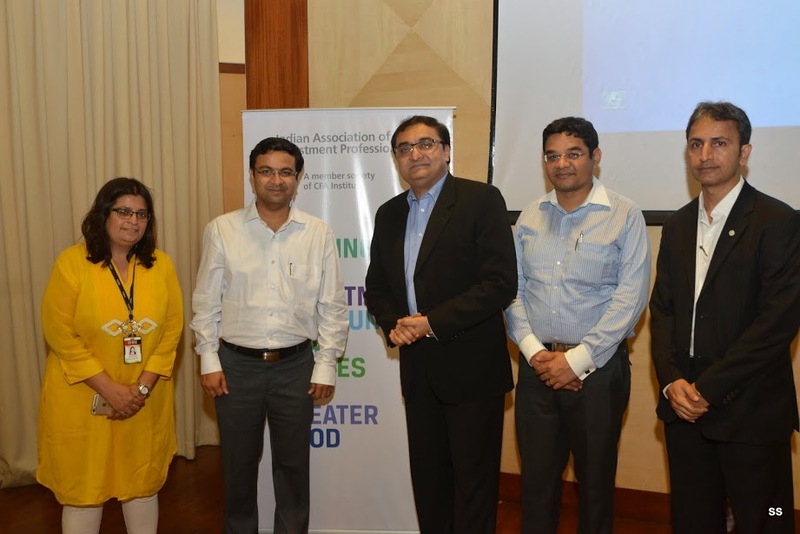 IAIP organized an interactive session with Akhilesh Tilotia, CFA, Associate Director, Kotak Securities leading Thematic Research and author of “The Making of India – Game Changing Transitions”, at the NSE auditorium on March 13, 2015. He spoke in brief about the contents of his newly launched book and also explained what transitions are happening in India and various challenges being faced given the state of country’s socio- economic conditions. Akhilesh explained that low price of services, such as water supply in Mumbai, does not lead to good economic outcomes. Lower prices means little is left to upgrade the infrastructure to meet the needs of increased population or maintain or improve quality of delivery. People end up paying higher costs by calling water tankers, which does not lead to optimal solution. In his words, there is private cost of public failure when important utility is kept at very low prices. One of the very important tasks for India is to create jobs for its rising youth population. The government estimates that 12 to 15million jobs needs to be created in order to employ the rising youth population. This figure is much less than 23-25 million he estimates (inclusive of female population), that will be needed to actually involve the eligible youth population of the country. The education system of India produces too many graduates, far more than the economy needs. Hence, there is a need to change the education system in India which places more emphasis on getting degrees instead of vocational skills which makes one employable. There is huge disconnect between what the policy makers think and what is the reality. When the NREGA was launched in the year 2006, it did a very good job of wage enforcement. However, it was not without cost. In fact it created distortion in the labour market leading to little productive work, shortage of labour and pricing out of the women workers from the agriculture market. In the last 10 years, imports have grown at 6X whereas the exports have only grown at 5X. The challenge now will be to ‘bring home the dollars’. In terms of development, India has done nothing when it comes to comparison with China. India has 352 SEZs of 510 square Kilometres (sq.km), however, China’s one SEZ of Shenzhen alone is of 493 sq.km. There has not been any significant rise of cities in India since Independence. China has large number of cities inhabiting population in the range of 2 million to 3 million, whereas India has very few cities with population in this range. In India we either have very large metros or mega polis or too small towns or villages. India needs to do a lot in this regards in order to plug this diversity. The belief that urbanisation is a threat to the population due to the changing food pattern of the country is a false notion. He explained that the urban lands occupy around 3% of the country land area, whereas the agriculture occupies 48% of the land. Even if the urbanisation encroaches a few more percentage points from the rest of the land area- which may not necessarily be from agricultural land, it is not going to detract from agricultural production. The shift to E governance in the recent period has been a major achievement for the nation. The very fact that 700-800 million biometric identity has been created will be a game changer together with the growing population of people using smart phones. By 2020, almost half of India’s population will be using smart phones and this is a great opportunity for the m-commerce. And with many Jhan Dhan bank accounts getting added every month, JAM Troika will result into direct benefit transfer and hence reduction in subsidy leakages. Another area that Akhilesh is concerned about is the huge cost that will be needed towards basic necessities. India’s Gini coefficient depicts lopsided prosperity and this remains a key concern. The program ended with many questions and answers and many of the attendees took delight in buying the autographed book that was on display at the venue. PS: For the copy of the presentation click on -> The Making of India – summary. For more details of the Book “The Making of India – Game Changing Transitions” kindly visit http://www.themakingofindia.com/. This entry was posted in Mumbai, Speaker Events and tagged Akhilesh Tilotia CFA, Chetan Shah CFA, Game Changers, Jainendra Shandilya CFA, Jayesh Gandhi CFA, Jayna Gandhi CFA, Kotak Institutional Equities, Kotak Securities, Making of India, Making of India - Game Changing Transitions. Bookmark the permalink.